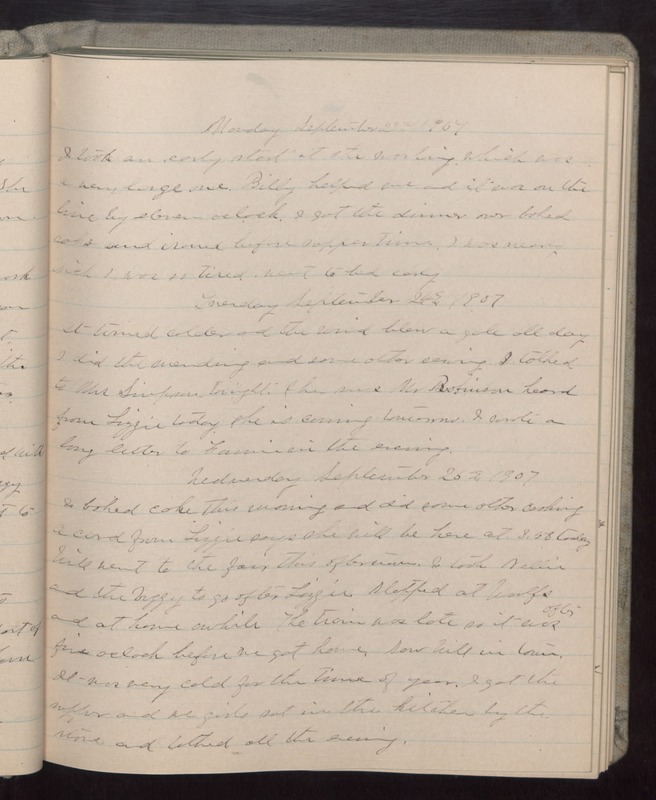 Monday September 23 1907 I took an early start at the washing which was a very large one. Billy helped me and it was on the line by eleven oclock. I got the dinner over baked cake and ironed before supper time. I was nearly sick I was so tired. went to bed early. Tuesday September 24 1907 It turned colder and the wind blew a gale all day. I did the mending and some other sewing. I talked to Mrs Simpson tonight. She says Mr Robinson heard from Lizzie today she is coming tomorrow. I wrote a long letter to Fannie in the evening. Wednesday September 25 1907 I baked cake this morning and did some other cooking a card from Lizzie says she will be here at 3.58 today Will went to the fair this afternoon. I took Nellie and the buggy to go after Lizzie Stopped at Woolfs and at home awhile The train was late so it was after five oclock before we got home. Saw Will in town. It was very cold for the time of year. I got the supper and we girls sat in the kitchen by the stove and talked all the evening.